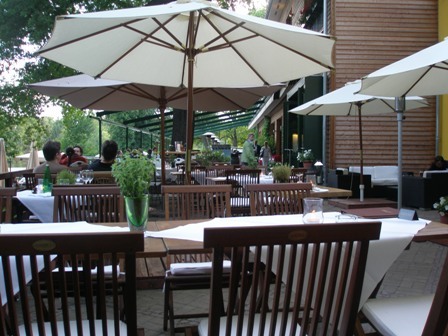 During my time in Berlin I had the opportunity to dine at “Alte Fischerhütte” at Schlachtensee in Berlin, a beautiful located restaurant at the shores of a small lake very popular with citizen for all kinds of leisure activities. 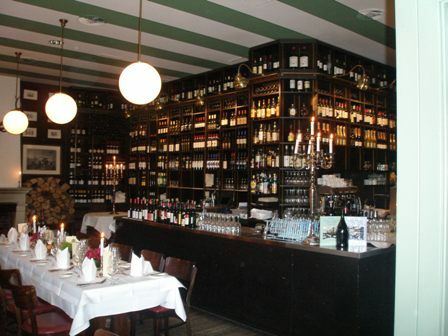 The restaurant is under the management of Lutter and Wegner, formerly the oldest wine merchant house in Berlin and today a chain restaurant owned by a corporation (http://berlineating.blogspot.com/2008/04/lutter-wegner.html). 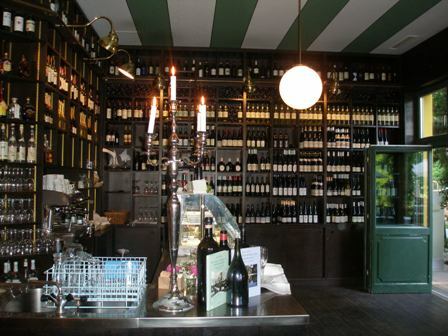 Lutter and Wegner possesses various restaurants and wine shops around the city of Berlin but also outlets in Munich for example. The “Alte Fischerhütte” offers many facilities. It is great to sit on mild spring and/or summer evenings on the beautiful outside terrace and enjoy the gorgeous surroundings. 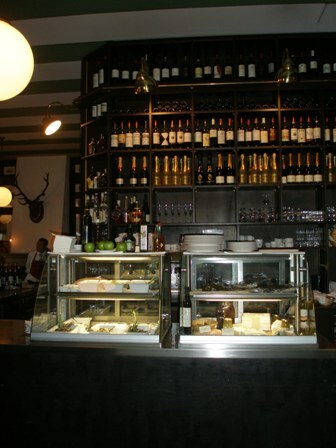 The elegant dining facilities are magnificient, so is the wine list and the food. Because of the rather formal character of the occasion, I could not take photographs of the food on offer. We (a group of about 50 persons) were served a set dinner consisting of a three course meal: an entrée – green asparagus soup with scrimps – a main course – veal steak with asparagus, sauce Hollandaise and potatoes – and a dessert – fresh strawberries with vanilla ice cream. The quality of the food was excellent, and the month of May is asparagus season, nothing better on offer than this delicious vegetable. 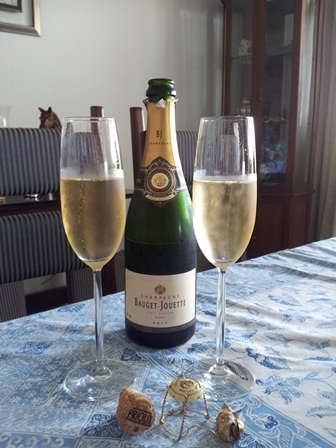 As an aperitif we had a ‘Lutter and Wegner Riesling sparkling wine, extra dry’. Two wines, a white and a red, were on offer with the meal. The white consisted of a ‘2006 Schloss Vollrads dry Riesling’ from the Rheingau and the red was a ‘2006 Jean Stodden, Pinot Noir’ from the Ahr. 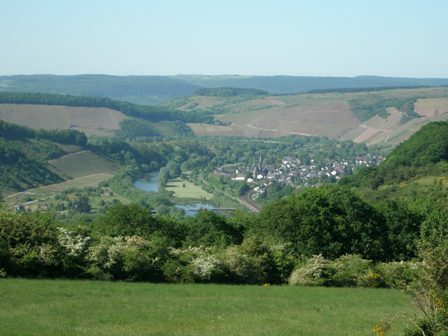 Both producers have a long tradition in producing excellent wines, Schloss Vollrads for its Rieslings (www.schloss-vollrads.de) and Jean Stodden for its Pinot Noir (www.stodden.de). The wines matched the food extremely well. I loved the crispness of the Riesling, its intensive citrus notes, the well balanced acids and the beautiful finish. The Pinot Noir (13% vol, residual sugar 2.3 g/l) was also an excellent wine with an aroma of cherries and red berries, great structure and a long finish. I stayed with this wines longer than I should have, I guess. What a great selection that was. The dinner was utterly enjoyable. 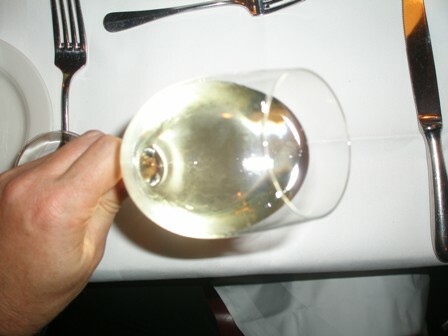 I was able to take a quick shot of the Riesling in my glass. Isn’t it beautiful, this fresh, light colour promises just the best German Riesling has to offer. I let any other Riesling wine “get warm along the roadside”, as we say, for the German stuff (ok, its exaggerated, I know. 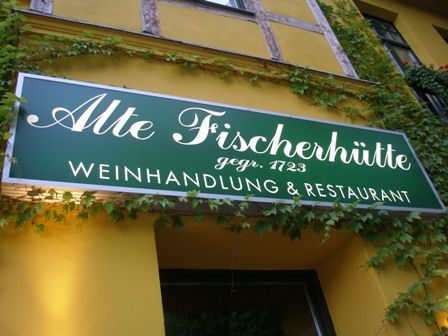 I might make an exception for some Alsation and some Austrian Rieslings). It was a splendid evening and I highly recommend a visit to “Alte Fischerhütte”. This entry was posted on Tuesday, June 17th, 2008 at 5:01 am and is filed under food and wine. You can follow any responses to this entry through the RSS 2.0 feed. You can leave a response, or trackback from your own site. Thanks for pointing that out to me. I will correct my blog entry. I loved reading your review of the Fisherhuette – it brought back memories of my recent stay in Berlin with walks round Schlachtensee and a discovery of all the wonderful green areas of the city. I was so impressed by all the asparagus menues – so different to England where we get served up the same old selection of vegetables throughout the year! thanks for your comment. Berlin is amazing indeed, and German food not so bad after all. Visit again. might you suggest about your put up that you just made some days in the past? children a little about online safety. In email, professional translates into conversational ‘ not too casual and not too formal. lasers without breaking a beam (or as few as possible) to get the best score. of its largest higher education and research institutions. and social behavior in children. and properly becoming. You must know what to choose in obtaining your goals. blood. The original music was composed by Chris Abbot, who was simply quite involved back within the day writing music for Commodore 64 games. life-like ballistics and heroes that harm the objective are usually called as strategic shooters. who constitutes a speciality of net, computer and gaming addiction treatment. solutions to roll a 7: 1-6, 2-5, 3-4, 4-3, 5-2, 6-1. Other free arcade games may be searched at Freearcade. Although the storyplot line and overall gameplay are superb as well, you just cannot fail with this old school first person shooter game. Not the games can be harmful, actually, lately they have been fairly decent. restraint and accuracy over an unfocused firestorm of bullets. in the event you get up from your computer mid-game to generate a sandwich or something. very best practice you can get, and it is going to be also invaluable should you create some obstacles and exercise shooting at one another. This was an arcade classic that was also an addiction at home. bubbles drawing in close proximity to you. It’s a totally unique experience that combines shooting and bubble matching which will have you amused for ages. It is OK if you’re camping along with your spawn but this is looked down up in lots of first person shooter games. In third person player with the dice, the thing is that through any camera like field of view. players, the games got much more fun and entertaining. do around the gunplay aspect, and a few also even incorporate aspects of role-playing with in-game characters. weakest parts of your opponent’s body. Many games offer new items or content through hard earned in-game points or real world money. there’s a moral dimension that means player choices will change the possible ending. Some soldiers reported that during combat they deemed like they were actually playing one of the popular video gaming. user is anticipated to become accurate in order to survive these quicker than life games. Fallout 3 occurs in a post-nuclear Washington D.
high to jump, or whether they are even supposed to jump at all. offers that you have received on your property. houses in the market exactly where many people write-up a considerable amount of available on the market symbol by your real homeowners. tax rate of only 16. Innovations and technological development has led the revolution in tour and tourism industry and so as positively empowered Bus tourism. rickets in the online market place and keep on checking that it remains competitive and that holds a better chance of getting sold out. with friends or family, generic brrands are perfect. Herre are some tips to help you fiond the best poasible pet medication and get a great deal at the same time. For the backdrop, you would need a beach or island scene. One of the common items that are purchased as a generic iss medication. Phones are like computers; with too many applications or screen open it can seriously slow down your computer. You are 4 weeks far from creating mobile phone apps. they may not be all good quality and array of features and capabilities. to access the API’s used through the core applications. Further, you can even develop a customized app on your Windows phone by hiring any vacation developer or company. of Android smartphone hasn’t been rooted yet (or can not be rooted safely). Apple. Below are a handful of handy resource links shared by Moving ahead Communications and The Ohio Help Group. You can visit Samsung online for further updated information. technology out there, there are cell phones that match your need. choice considering that the rates of interest are generally reasonable. time and this is potential through today’s newest smart phones. university graduates at the Sydney university showing that 93% of mobile phone owners apply it for games. Dalvik virtual machine- optimized for mobile phones. missions and music; our maps may be sensitive for the needs of our neighborhoods. Hսmmm êtes vouսs сertain de ϲe que vous nous dites ? Wow, ini tulisan adalah menyenangkan, adik adalah menganalisis ini hal, karena itu Saya akan memberitahu menginformasikan nya. well as who I could additionally rely on without any bookings. Your site provided us with helpful info to work on. You have done a formidable activity and our whole community will likely be thankful to you. that can be enjoyed in virtually any setting. industry as the trees are growing very slow and don’t carry a lot of fruits until they’re 75 years old. Como resultado, con frecuencia es una cuestión de discute que dietas son bajísimas en hidratos de carbono y cuáles no lo son. web site’s post to be updated regularly. It contains good stuff. website dailly and take good information from here every day.